Take a look at some of the finest images of food, drink and people from the past twelve months. Every year, the Pink Lady Food Photographer of the Year awards show how food and art can (and often are) one and the same. Some truly stunning images are submitted every year, covering everything from beautiful plates of food to the people who spend their lives creating it. With the likes of Instagram becoming an integral part of how restaurants gain a following, the way food looks has never been as important. The awards champion both professional and amateur photographers, with the winner taking home £5,000. 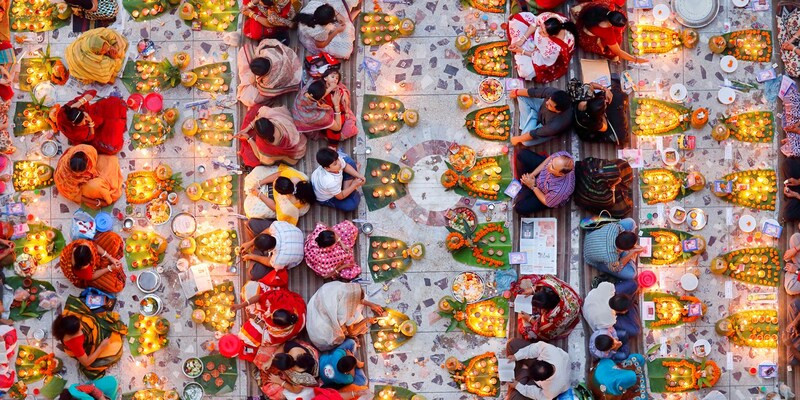 This year’s recipient was Noor Ahmed Gelal, who took an incredible shot of people breaking their fast at a Hindu temple in Dhaka, Bangladesh. The judges – which included food photographer David Loftus, chair of the James Beard Foundation Emily Luchetti and chef Ferran Adria – chose it out of 8,000 entries from sixty countries. Take a look at Noor Ahmed Gelal’s winning image below along with all the other category winners in this year’s awards.